Loved the condo! Amazing views, great location, updated and clean. The house was very clean and well maintained. It was furnished well. We thoroughly enjoyed our stay in #25. The unit was very nicely decorated and very comfortable. The kitchen was great, and having the counter with stools was very convenient. It was nice having two full bathrooms. The entire property was very well maintained, and the manager was very helpful with suggestions on what to do in the area. We would stay here again. We loved the cabin and the location! THe cabin was clean and comfortable. The deck and windows and sliding doors made the lake feel close inside or outside. Enjoyed the fire-pit too. Easy access for anyone who may not be able to do steps. The only complaint is that we are tall and the shower head was low. But, that will not stop us from going back. Bring cooking spices. This was our third stay at Heaven Sent and, once again, it was absolutely perfect! The cabin was very clean and well prepared for our visit. Even with a couple of rainy days, we had a wonderful time. The views are beautiful no matter what the weather! This is without a doubt the best place I've stayed! 2nd timer now. I so appreciate getting to stay in a place that has it's own unique style. The views were great out of each window. A photographer's dream! We appreciated that the owners allowed us access to the nice china, coffee and all those incredible books. These are the sorts of things that made our stay feel nicer. Location, can't be improved on. We had 3 days with very little sun. The weather received mixed reviews, all else great! Pros; Great unit,awesome views, clean, loved the location, beach firepit and grill was the bomb! Cons; Too many check in emails. Did not like your policy on removing your garbage and recyclables,that should be included!! 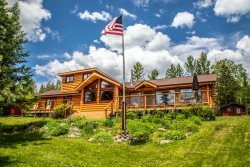 We have used Cascade Vacation Rentals for several years; renting various cabins and some of them being rented more than once. The staff at Cascade Vacation Rentals is always friendly and personable - I would be too if I could work on the North Shore! They respond in a timely manner and are very accommodating. We have stayed at Superior Retreat more than once. We like that it is close to town and yet we don't feel like we are in town; it's quiet and the surroundings make us feel secluded - which is what we want when we vacation. The privacy and hominess of the cabin (vs. a resort or motel) really made our stay special. It's like a home away from home. It was comfortable, charming, clean and quiet. The outdoor environment (quaint deck, woods and yard, path down to the rocks at Lake Superior's shore to include a fire pit) were stunningly beautiful and satisfying. We felt energized and relaxed and completely content all at the same time! And after a strenuous but wonderful day of hiking and sight-seeing, it was the perfect place to come home to. We enjoyed the family photos, presumably of the cabin's owners. They depicted a smaller family, possibly 3 generations in the 1970s - to a family that had grown much larger in the 90s or early 2000s. The decor and personal touches were just neat! The cabin had everything we wanted or needed for cooking, cleaning, playing games or relaxing, storage of our items, etc. The only drawback was the poor water pressure in the shower. The tub and sink faucets were fine - it was just the shower head, making showering more time consuming and difficult to feel fully rinsed of soap, etc. But it wasn't a deal breaker ... we will be back! We loved it!!! Thank you! The home and location were great. The automated email from cascade was great. The kitchen supplies were great. Bed and blankets fine. Would have liked cleaner windows.